The Elder Scrolls Online is getting a big update in August. 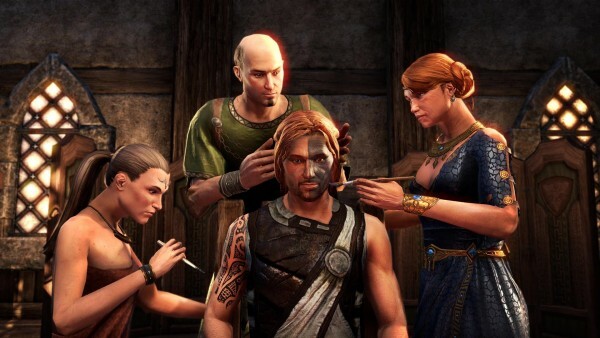 The Elder Scrolls Online‘s Update 11 has been fully detailed. This mega-patch will be out August 1 on PC, and August 16 on PS4 and Xbox One. Update 11 brings two new, Argonian-themed, four-player dungeons – Ruins of Mazzatun and Cradle of Shadows. These will be available for free to ESO Plus members, and will cost everyone else 1,500 crowns in the store. The Style Parlor is also being added, allowing you to buy appearance change and race change tokens. Using these, you’ll be able to change hairstyles, body markings, race, facial features, character voice and more. You’ll be able to change your character name, too, using a token. ESO Plus members get exclusive costume dyes that allow them to change the colour of their equipped costumes and hats at a dye station. These dyes can be rewards for unlocking achievements. Dye stamps are another thing being added. These come pre-loaded with a specific set of colours, and can be applied to costumes and hats as a one-use consumable. Finally, console players will be getting the long-requested text chat. For the full list of detailed additions, see the official site.